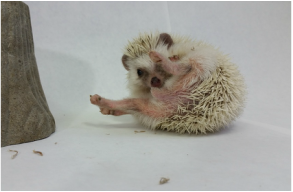 Prickle - Animal Wonders Inc.
​Prickle came to Animal Wonders after she was abandoned by her previous owners at a local pet store. She was extremely malnourished and obsessively running on an exercise wheel. Her back right leg holds the scares of an old break, but she manages to move around with just a slight limp. Her favorite things to do are: eat waxworms, run on her exercise wheel, and bundle up in soft blankets. 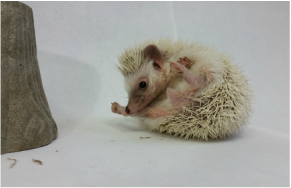 She's a spunky little gal that loves to explore new places, which makes her a wonderful ambassador.